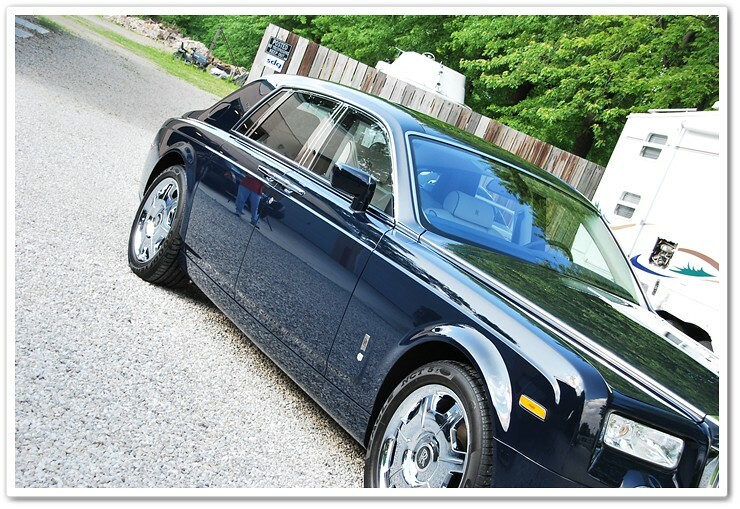 DJ Mayo of Reflections Detailing and Todd Cooperider of Esoteric Auto Detail team up on a 36-hour paint correction detail on a stunning Rolls Royce Phantom. A short while back I was in a bit of a bind…I had much more major paint correction work to do in a short period of time than I could handle myself. First up was a massive Rolls Royce Phantom, then a Maserati Quattroporte, and finally a Ferrari 360 Spider. All 3 jobs required a tremendous amount of work, and they needed to be completed within a week’s time. Knowing that I couldn’t fit 80 hours worth of detailing myself into just a week, I called up my buddy DJ Mayo of Reflections Detailing and asked him to make the 400+ mile trip from Virginia to Ohio to help me out. DJ and I have worked on cars together before, and I knew that I could count on him to make this marathon week happen without any issues. In the detailing world it’s rare to find two detailers with very similar styles, ability, techniques, passion, and attention to details that can work together in a seemless manner, but DJ and I really complement one another when doing this level of work. We put in long hard days, we have fun trying to out-do each other, and in the end we produce amazing results (if I don’t say so myself!). 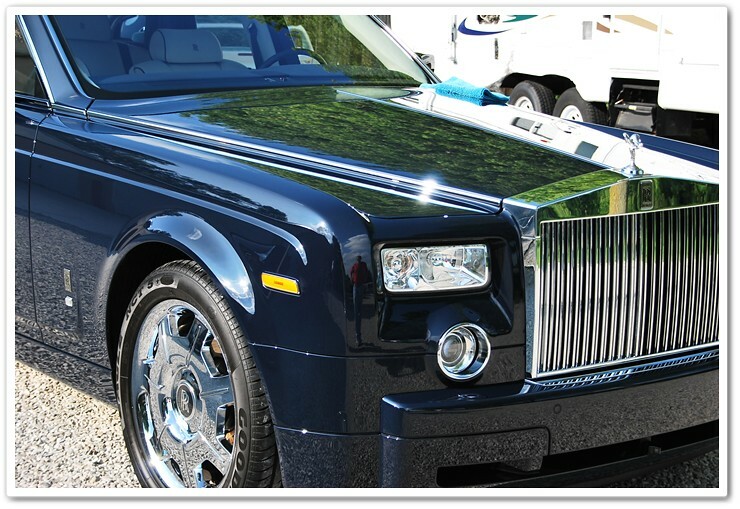 OK, so let’s take a closer look at the Rolls Royce Phantom. Perhaps the most distinguishable feature of this car is its sheer size. While it might not be the absolute king of large cars, it has to at least make the podium! At over 19 feet long, more than 5 feet tall, and 6.5 feet wide, this beast has a tremendous amount of surface area to work with. Weighing in at a hefty 5800 pounds, the 453hp V-12 motor still propels this freightliner to an impressive 0-60mph time in around 5.7 seconds. Anything under a 6-second 0-60 time is good, but when you look at this car in person to see just how big it is, those times become that much more stunning. 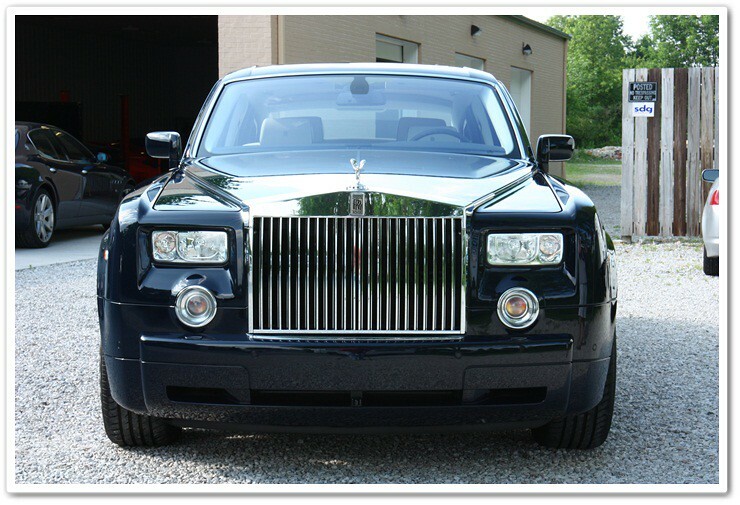 The hand-crafted, built to order Phantom is a marvel of luxury and refinement, and everything about it exudes quality. The touch, the feel, and the action of all of the controls of this car is at or above the level of any vehicle I’ve experienced before. The entire time DJ and I were working on it, we were in total agreement that it would make the ultimate road trip vehicle! Upon initial inspection of the Phantom, I noticed that it had a moderate amount of swirls when viewed in the sunshine, and under close inspection with my Brinkmann LED light I could tell that it had been compounded at some point with heavy wool pads, and not finished down properly. This was most likely done at the factory as they wetsand the paint to get rid of orange peel and to promote the highest level of reflection in the paint. 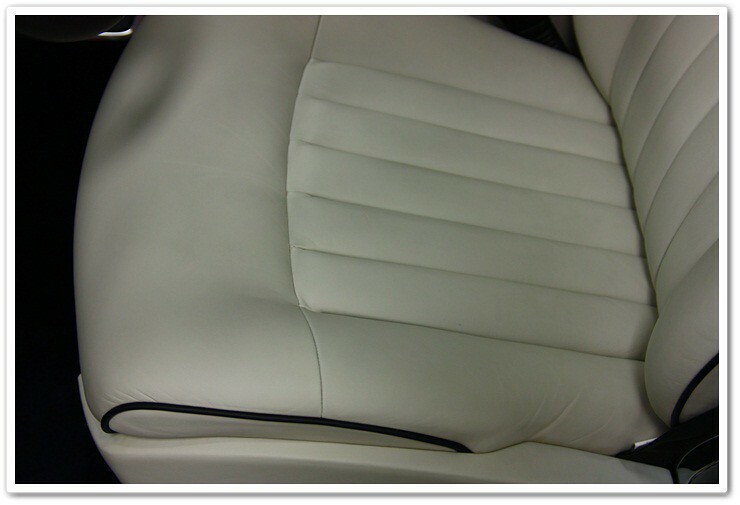 Wool is good for restoring gloss after the sanding process, but if the proper refinement steps aren’t taken afterwards, you will be left with deep, circular defects that can become very difficult to remove. Unfortunately this is pretty common with high-end, hand built vehicles. 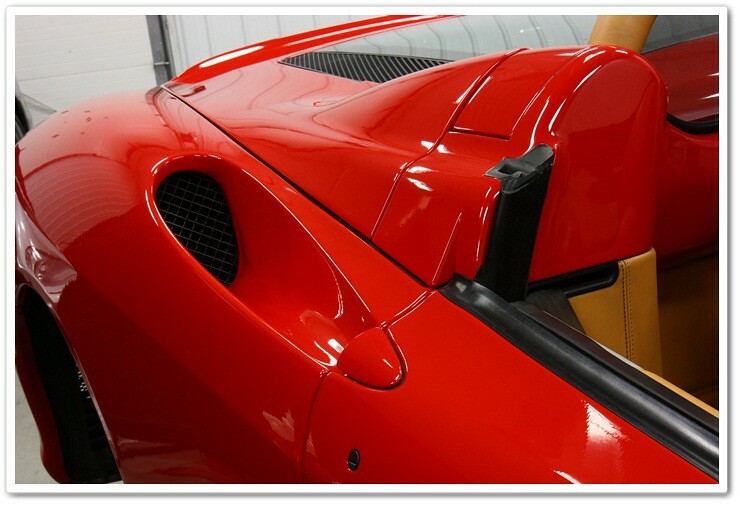 While these vehicles look good when they’re new (or used for that matter), the finish can be taken to entirely new levels once a true paint correction specialist has taken the time to refine it. Knowing that we had 3 long jobs lined up for the week, we decided to tackle the Phantom first since it would be the biggest job of them all. We might as well get the unpleasant part out of the way first! We quickly realized that the car was too big for the lift, and quite frankly it worked out for the best because the last thing we needed was for this behemoth to be any higher off of the ground. So we pulled it in to straddle the lift, and got busy. 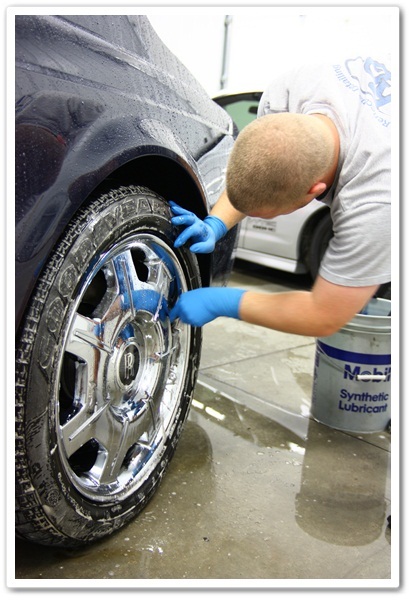 While I started with the pre-polishing prep process (washing, claying, taping), DJ worked on the 21″ wheels with the safe and effective P21S Wheel Gel and an EZ Detail Brush. 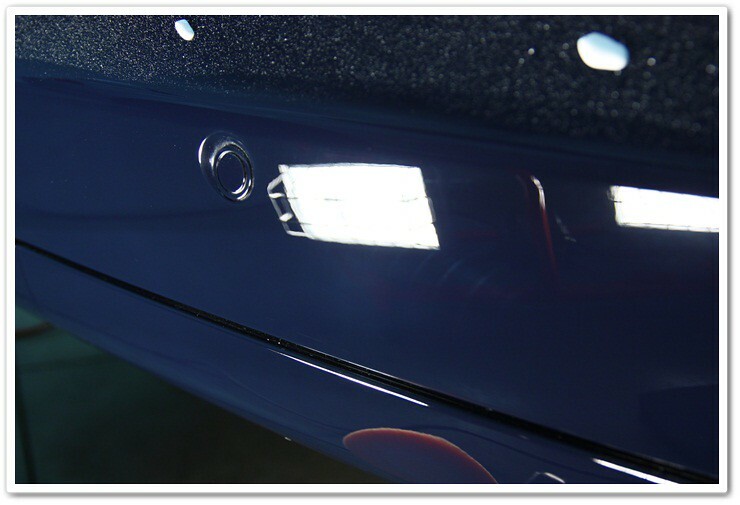 The painted surfaces were stripped of any remnants of previous waxes or sealants to aid in the polishing process, and then we proceeded to test combinations of compounds, polishes, and pads to determine the best course of action on this particular car. 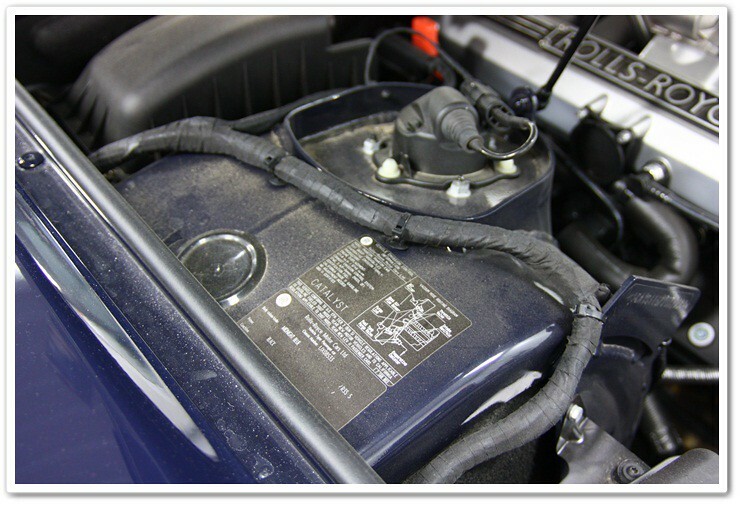 It’s always a smart idea to take a small section of the car to figure out a system to avoid any problems, issues, or wasted time later in the process. Under our halogen lights, DJ first tried Menzerna Super Intensive Polish and an Orange Light Cutting Pad on the Makita Rotary to see if that would do the trick. Upon initial inspection it looked like a winner, but after looking more closely in the Brinkmann LED lights, we realized it wasn’t getting the level of cut that we needed. So our first impression was that the paint was relatively hard and therefore would require a more aggressive combination. As you can see from the work cart, we have a selection of bufers, polishes, and pads ready for our test section. 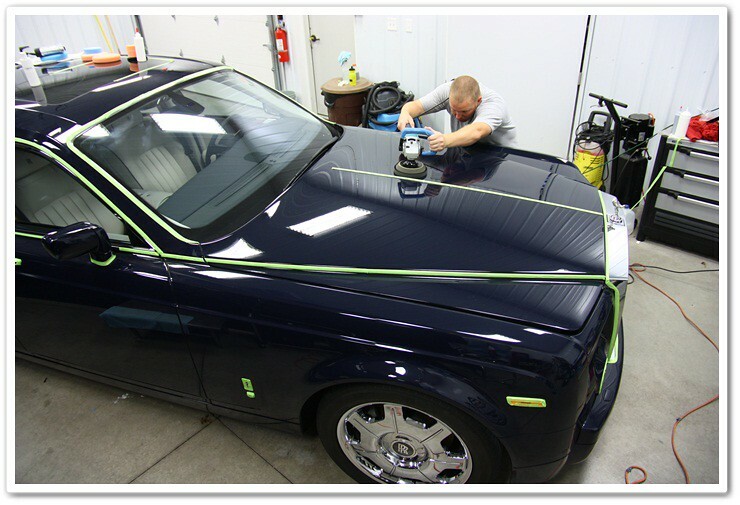 Rolls Royce Paint Proves to be a Challenge! Sometimes when performing paint correction you run into paints that simply don’t want to cooperate. 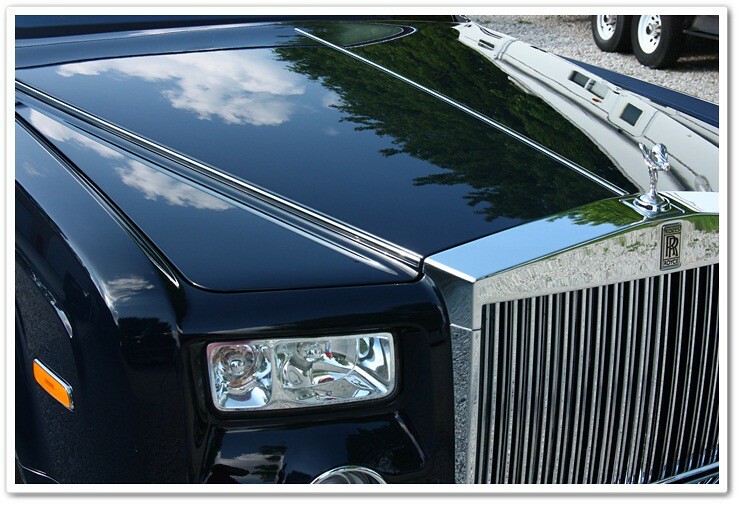 While you have incredibly easy cars/paint like Porsche on one end of the spectrum, you end up with paints like on our Rolls Royce that can give you nightmares! And sometimes you get cars where you find that your approach, tools, techniques, and products that work well at the start of the car aren’t cutting it at the end of the car. 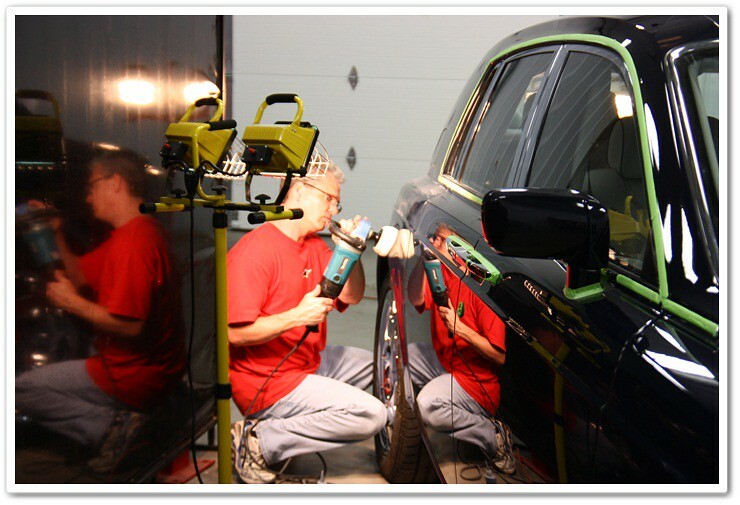 The difference in highly skilled professional detailers from those who don’t produce as good of results is in the ability to diagnose the needs of the paint, select the proper tools and techniques for that particular car on that particular day, and the ability to adapt and change during the course of the detail to meet the needs of the paint. Knowing when to change the approach and techniques to maintain a high level of paint refinement is absolutely critical at this level of detailing. While DJ was developing a system on the trunk lid of the car, he was finding that some of the traditional methods and combinations simply weren’t working. Since he is a true pro at what he does, and he is so passionate about producing the best finish you can get, he soldiered on for hours in search of the right combination…the Holy Grail so to speak (it’s a British car afterall, so I’m allowed to throw in a Monty Python reference!). In fun I was giving him a hard time about spending so much time on just the the trunk lid, but he gave it right back to me claiming that it would be the best looking trunk lid anybody has ever seen! So once we had a bit of a system dialed in, I proceeded to compound one side of the car for quite a few hours (all the while DJ was STILL working on the trunk lid!). Meguiar’s M105 Ultimate Cut Compound paired with a Cyan cutting pad on the Makita rotary proved to be the winning combination for this step in the refinement process. As you can see from the photos below, just the compounding stage alone made a significant difference in the overall look of the paint. Here on the lower rocker panel, you can see the darker blue color to the right where I have compounded, and to the left you can see the amount of haze from the swirls that prevent the true color from showing through. 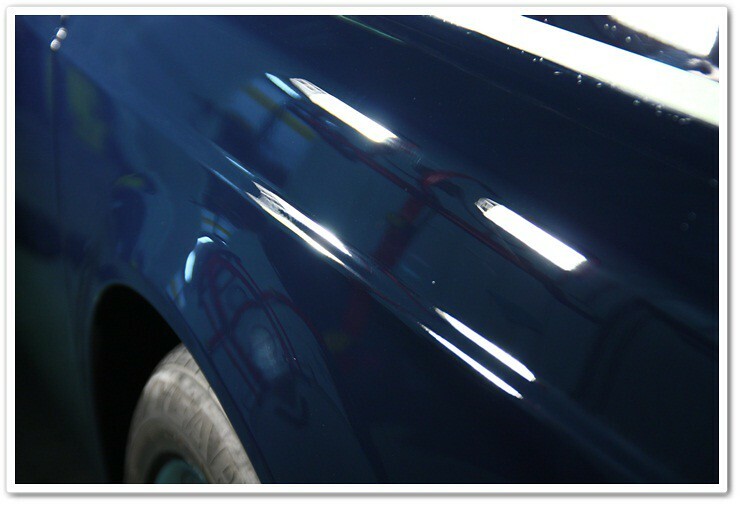 And here it is after compounding, yet before we went back with finish polishing to further refine the paint. Already you can see a huge difference in the clarity now that the swirls, buffer marks, and general haze has been permanently removed. Upon return from lunch we once again grabbed out Brinkmann LED inspection lights to look over the areas we had just worked on. To our dismay, we found that some of the defects had “returned”. A few things can cause this to happen. One of them can be from a compound or polish filling in the defects instead of correcting them. This can happen when they’re not properly used, or if it’s simply a product that has a lot of fillers in it. We had been using Isopropyl Alcohol to wipe down the surface for inspection and knew it wasn’t a problem of filling. Another cause of this is when you heat up the panel / paint and it actually expands. When this happens it appears that the defects are gone since some of them have “closed up” because of the heated expansion of material. Once it has had ample time to cool however (over lunch break), you can find that not all of the defects are actually gone. At this point you can panic, or you can just go back and methodically re-work those areas, and those on the entire car until you know that it is fully corrected. Yes, it requires more time and patience, but it can make the difference between a good detail, and a great detail. DJ and I chose the route of the great detail and continued to check our work and refine the finish until it was truly and fully corrected. You don’t run into paints like this very often, but when you do it can be frustrating if you allow it to be. So take the advice from the words on the cover of The Hitchhiker’s Guide to the Galaxy and “DON’T PANIC!” (yet another obscure British movie reference…I’m full of worthless trivia such as this!). OK then, back to the detail. I’ve repeated myself in saying how big this car is, but here are a few photos to illustrate that point. No, DJ isn’t 4’11″…this car is really, really big! 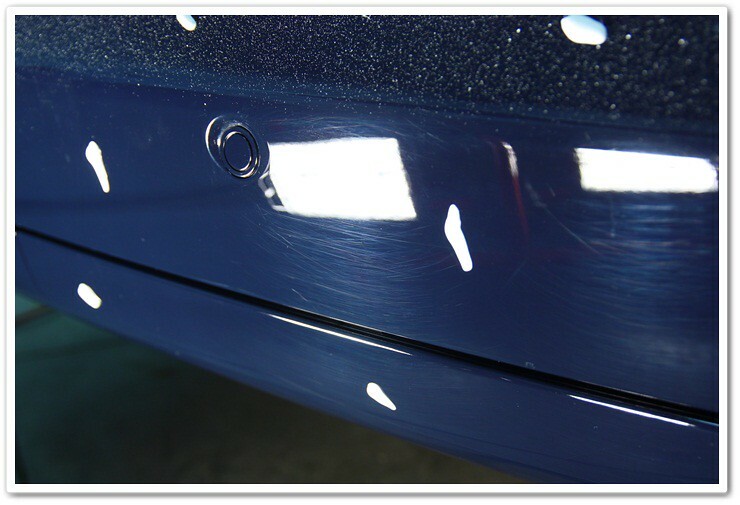 While using a small, 4″ spot pad on a car this size won’t get you very far, it was a necessary evil considering the curvature and body lines in some of the areas. Here I am working the finishing stage with a white polishing pad and Menzerna 106FA polish. Once our compounding and polishing stages were complete, we took great lengths to get all of the residue and dust out of the cracks and crevices. 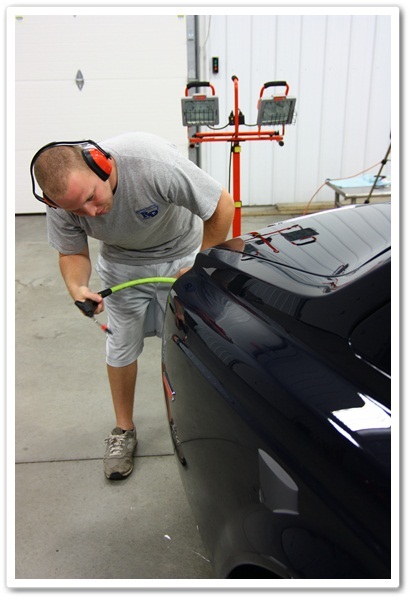 Here DJ is using compressed air (with proper ear protection) to clean the areas that can’t be reached by hand. 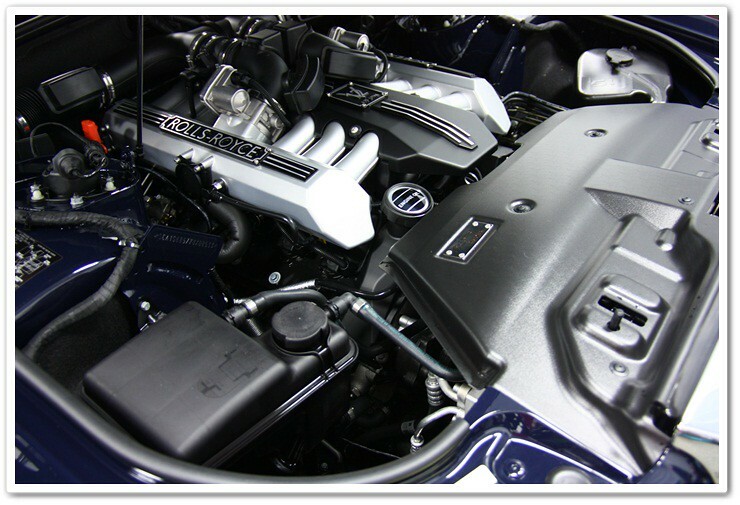 The next step in the process was to detail the dirty engine bay. Usually we will clean this during the washing stage of the car, but to be quite honest with you, I don’t recall while we waited to do it afterwards! It was a tag-team effort using P21S Total Auto Wash during the cleaning step, and 303 Aerospace Protectant for the finishing step. Afterwards, it looked brand new once again. 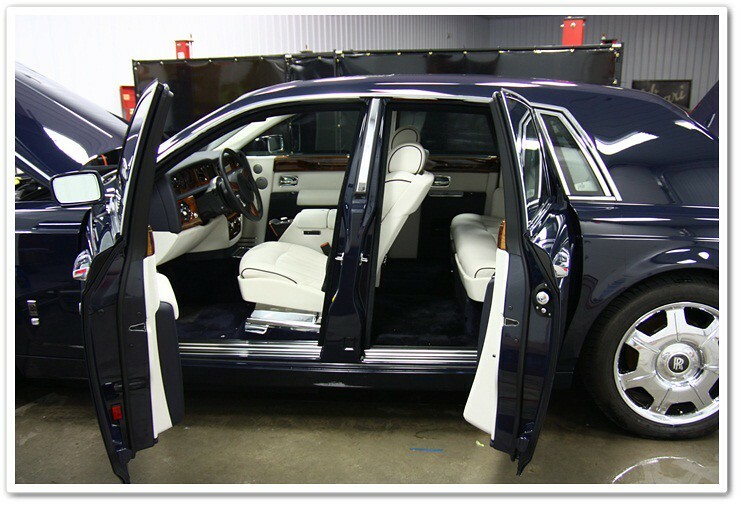 The rest of the interior was tidied up, and all hard surfaces were cleaned and protected with Meguiar’s Quik Interior Detailer. We’re getting close to the end here, so it was time to prep the vehicle further for the application of a durable sealant. 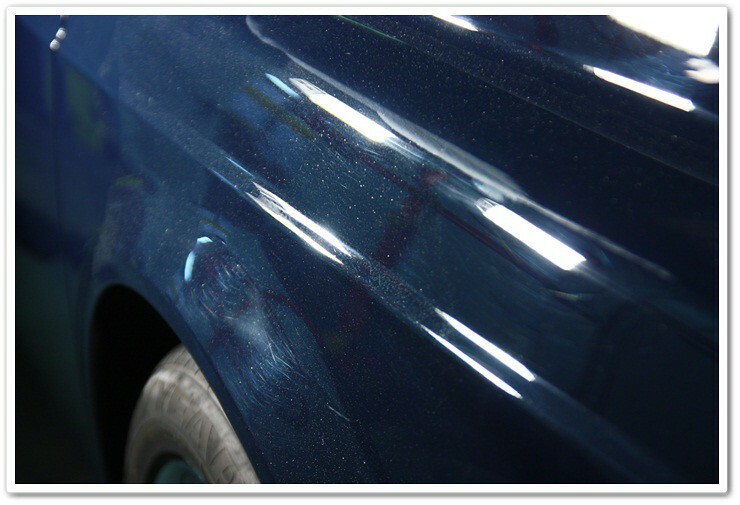 Since we used so many different kinds of polishes on this car, we decided to re-wash it afterwards to ensure that all of the polishing residue was fully removed from the surface to ensure a good bond. 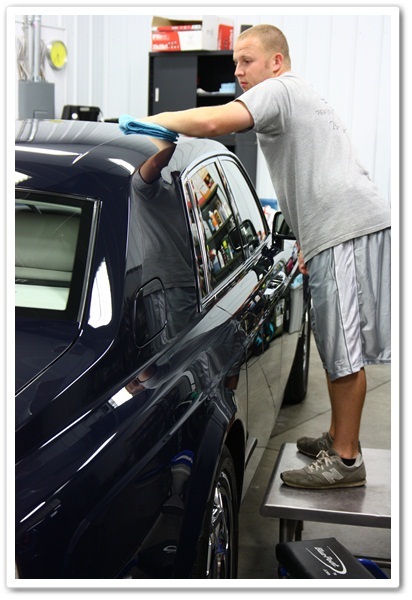 For this step we used Chemical Guys Citrus Wash & Clear at paint prep ratio to strip the surface. Once it was finished with the second wash, we used Chemical Guys EZ Creme Glaze to give it that extra bit of gloss, and then topped that with Blackfire Wet Diamond paint sealant for protection from the elements. 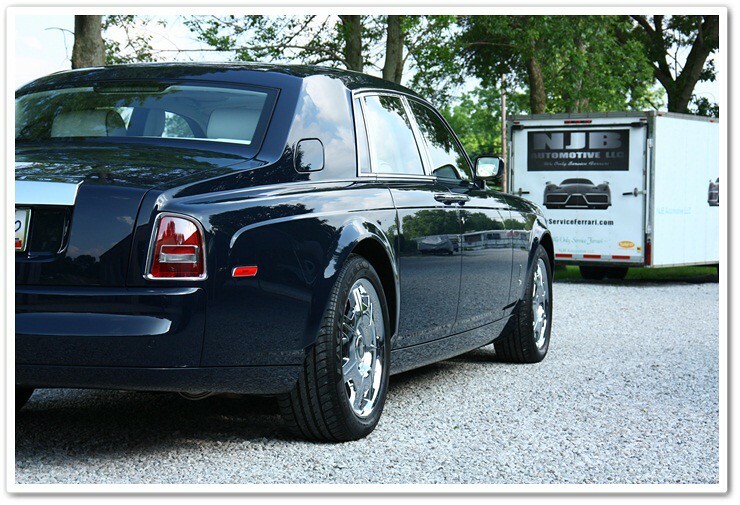 After 36 hours of compounding and refining the paint to remove at the very least 95% of all defects, performing a complete engine detail, and thoroughly detailing out the interior of the Phantom, we were ready to take a bunch of photos to show off the renewed beauty of this car. 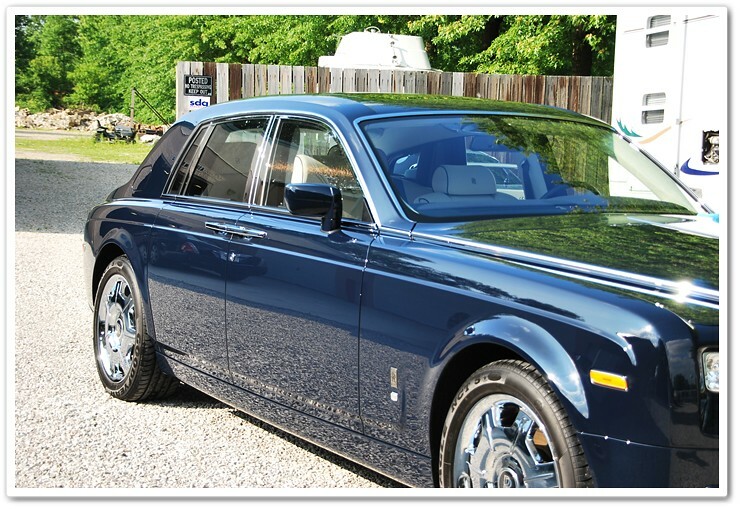 We know that it came from the Rolls Royce factory with defects leftover from the wetsanding and aggressive compounding processes there, so at the completion of our extensive detail, this car looked better than when it was brand new. Both inside the walls of the shop, and outside in the sunshine, the Phantom was nothing short of stunning! 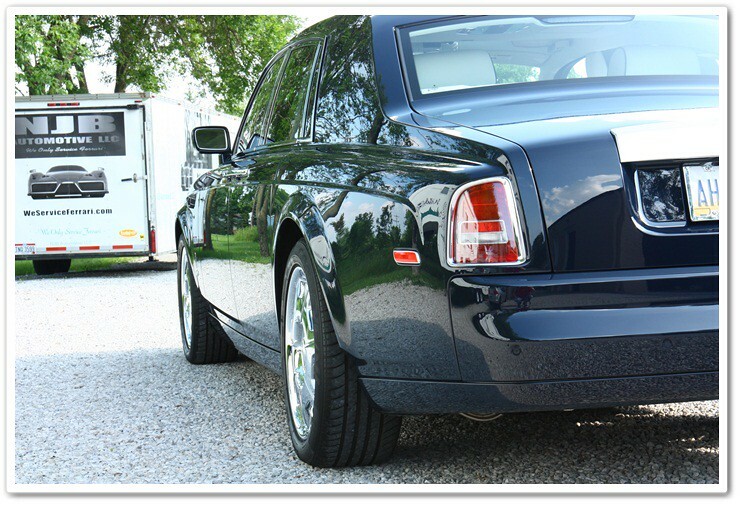 We only wish that it was being delivered to a Rolls Royce gathering afterwards because other owners of this elite brand would have been absolutely amazed at the level of refinement that this paint was taken too. 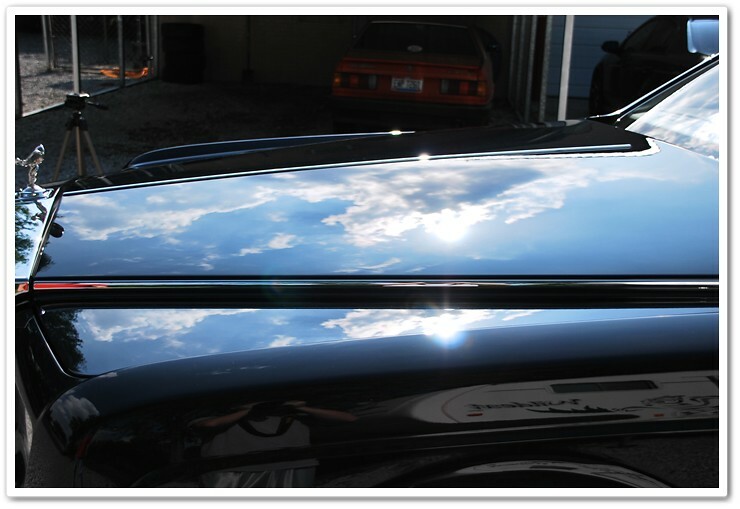 Highly refined paint = stunning clarity in reflections! Thanks to DJ for driving all the way up to Ohio for a week to work with me on the Phantom, Maserati, and Ferrari…and thanks to everybody for taking the time to read through our article! Stunning work. I do have a question about the heat that caused the defects to reappear. Is this something that you normally would see when using a rotary versus a DA? incredible work! thanks so much for posting these write ups for us! AMAZING as always guys. The car looks stunning! Amazing. And a huge car – about the size of my Suburban. What role does the glaze play if you’ve removed the defects? You and Dj always surprise me on each correction you do. This Phantom came out amazing you guys are a great team nice work. One question I see you use Meguiars Quik Interior Detailer alot. Do you know if DI is going to carry the new gallon version of it that is being released this year? I use this alot as well especially on our 2010 Mercedes ML350’s interior to keep it looking clean and protected with out a greasy look. Big Car and Big Project… Great Job. 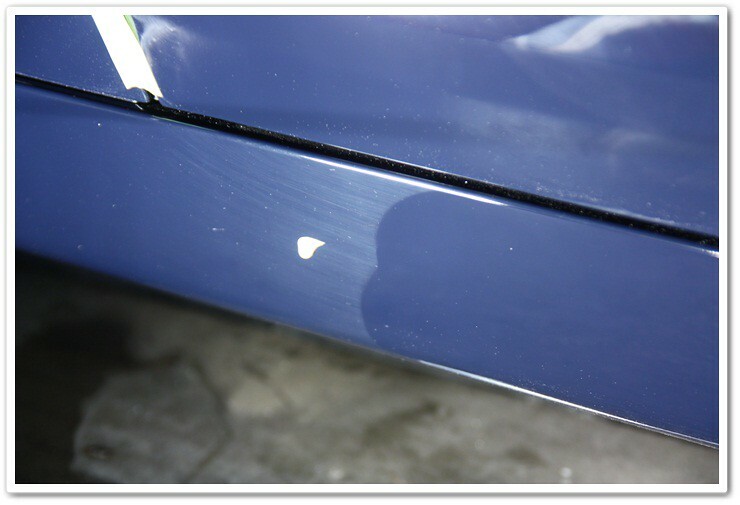 The swelling was cause by using the rotary polisher. Like Todd explained it doesn’t always happen it’s actually rare to see this. We came back from lunch and a few of the deeper scratches had reappeared. 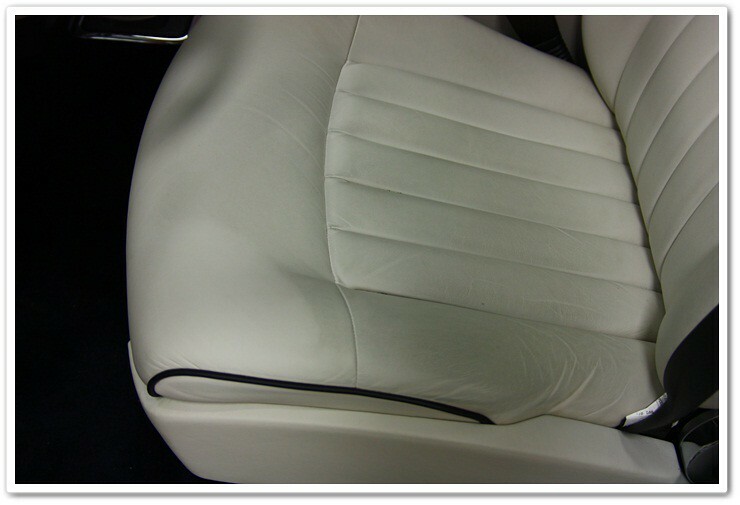 The condition of the car was surprising in a way, we would start to remove the swirls and defects and other defects under the swirls would become visible. This would cause us to go back over the area with a more aggressive method, then having to do multiple steps refining the paint. Using the Chemical Guys EZ Creme glaze not only adds a bit of gloss to the leveled paint, but it also cleans the paint even further which ensures the best possible bond between the sealant and the paint. The name of the product throws people off, but it is not a traditional glaze, it is more of a pre wax/sealant prep product. 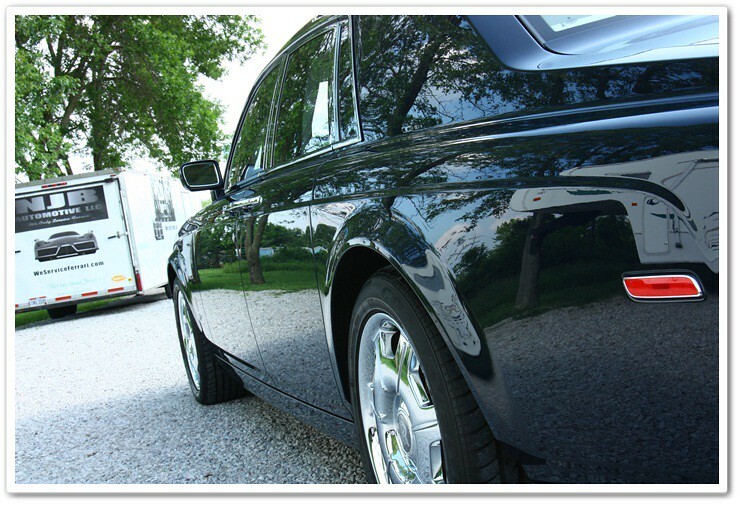 If you haven’t tried it before applying your favorite wax or sealant, it is highly recommended. I am not sure about the Gallon size of Quick Interior Detailer. With how popular the product is I am sure you will likely see it in the store soon enough, I have yet to speak with George and Greg about this addition. Thank you for the comments guys it is always appreciated, especially when you have two guys spending 2 long days to complete 1 car. Todd I cannot agree with you more, it’s very rare to find two guys doing paint correction completely in sync with one another, you could look at this car with any lighting and can’t tell where one began, and the other ended. Stay tuned as we will have several projects from all over the world to share with you guys. DJ “Jazzy Jeff” Mayo and Todd “#1 Michigan Fan” Cooperider have done it again. Outstanding work fellas and I believe the outcome says everything. Bravo! Good job guys. That car looks awesome and the amount of reflection coming off that thing looks amazing. #1 Michigan Fan? Todd, say it ain’t so. The car looks great. That is an insane amount of high quality work you guys got done. Thanks for the great write up. Thanks…and it ain’t so! I’m about as big of an OSU fan as they come, and Marc’s just trying to stir up trouble (he is from the SE MI area afterall!). It was a lot of car to work with, but it turned out tremendous in the end. What rotary backing plates do you guys prefer using? It looks to me like DJ is using either a Scholl or the new Sonax backing plate (referring to the blue foam backing plate attached to the Makita 9227). It also looks like later on he is using a Gloss it backing plate (the black foam backing plate attached to the Makita) I have been wanting to purchase the 3M Perfect it III foam backing plate so that it conforms curved body panels. I am just curious because it looks to me like you guys are using similar version to the 3M one. Also how do you like the ones you guys are using? I am using a 3M one that I have had for a while now and the black one is the W66 Meg’s that DI carries. The size, before and afters, color, clarity, effort…just…WOW. Beautiful work as always. Honestly, I would have Panicked at the re-appearing defects…lol. Anyway, thanks again for your awesome write-ups and beautiful work. 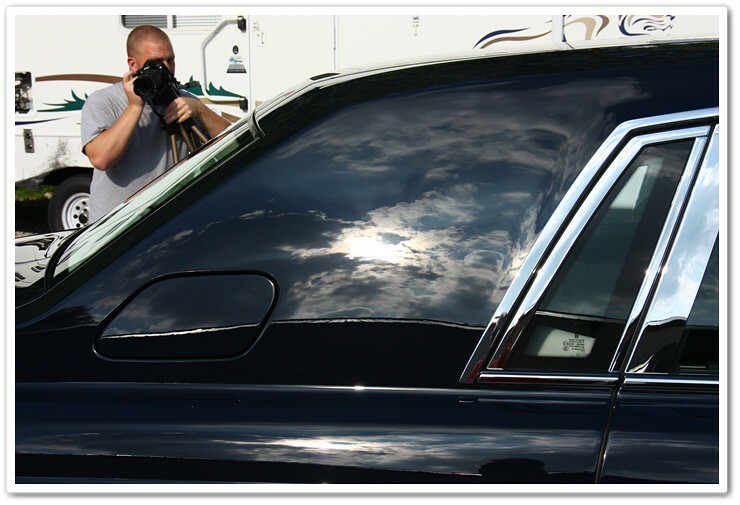 DJ just completed a major paint correction on my black 2003 Lincoln Navigator. The car has only 21000 miles and was literally mint before a severe accident when i was broadsided by a car. After a body shop did the metal repair it was clear they had left me with a mess, vast wool swirls and more. Perhaps DJ will post before and after and his methods but the one side was literally grey not black due to the condition of the surface. DJ can confirm this but i believe the job was 26 hours, and to the point not sure DJ will ever touch a black Navigator again. Well the end of the story is when i went into DJs shop, not only was the car in better than it was when i took possession new from the dealer, but no sign of any surface imperfection was visable. i didnt want to take it out of the shop to let any weather or dirt get on it-but DJ said-his work was done and he had enough of black navigtors perhaps for life. well all i can say is i do hope he will share with all the secrets of how he took a disaster and turned it without question into a new car. i left him my prize car on the way out, a very rarely configured Red Mini which may be the next story. much less stress for DJ and lot more fun-he may not return the mini to me!!! Now i know why i like black cars-when the finish is done right-nothing like it, of course the red mini has another view. incredible work, great write up, and excellent photos, You guys are awesome, and makes me want to try that EZ creme glaze out. Simply awesome. Looks perfect now and shows why you’re two of the best out there. Great work! 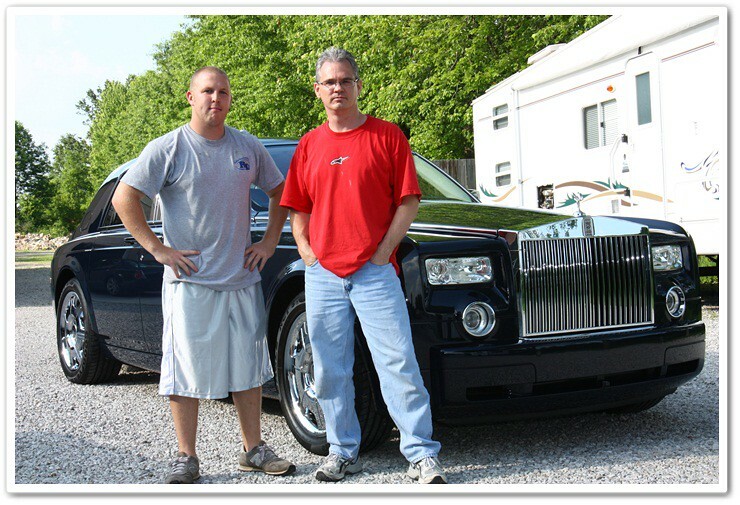 Todd and DJ – you rocked this humongeous RR out of the park! Guys, this detail is amazing! I worked on one of these a little while back and to do a near perfect detail on it takes a lot of skills and time. The pictures speak for the kind of dedication and quality you 2 put into your work. As good as it gets! Bravo!! Do you guys wipe down with IPA after all the machine work is done? What you guys experienced with the deeper marks re-appearing is called drop back. It occurs when you need to work a panel long enough for it to become quite hot. 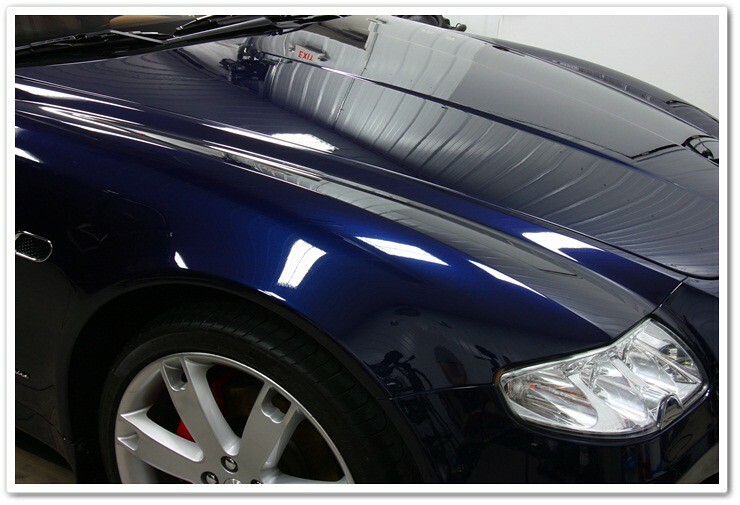 The clear coat swells temporarily whilst hot, showing a beautiful flawless finish. Then it cools down and some of the deeper marks reappear. The same can be said for carrier oils in some compounds. Such as 105 and 3m fast cut plus. Fast cut plus fills a lot. Therefore an IPA wipedown is essential to assess the true finish of the work carried out. We knew that there was a swelling issue that we were being faced with…it was just much more severe than we had experienced with any other paint, regardless of how much heating we had put the panels through. We don’t publicly discuss the rates that our clients pay, but a detail like this would be a significant investment to many people. Wow that looks amazing. 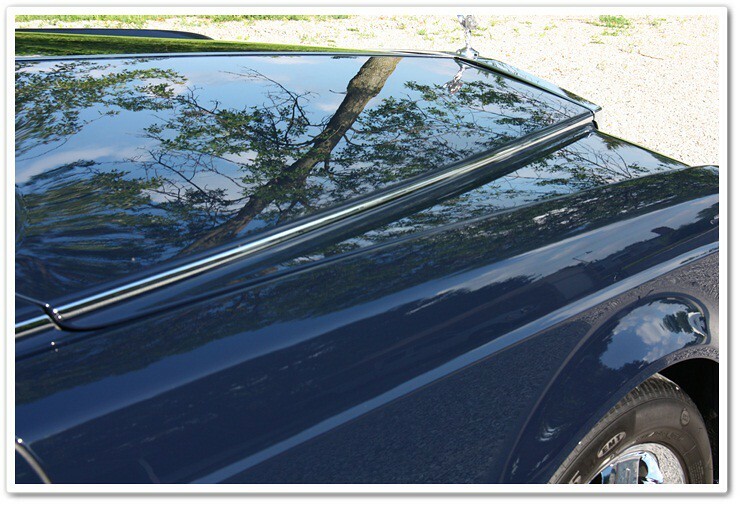 I’m fairly new to this so please excuse my basic questions….Regarding the clearcoat, it looks like you compounded fairly aggressively on the Rolls, what affect did this have on the thickness of the clearcoat (i.e. how much of it was polished away) and what are the implications of this to future polishing that this car may undergo? What happens if most, or in spots all, of the clear is polished away? 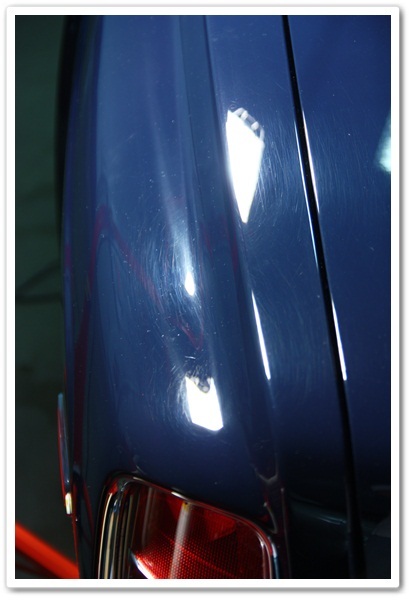 In average cars you may be looking at a clearcoat thickness of around 35-50 microns. When using proper compounding techniques, you should only be removing a total of 2-3 microns. So as you can see, you should have plenty to work with in most cases. If I remember correctly, this car had very thick readings with plenty of clearcoat for future polishings as well. When you start getting into older cars though, you need to inspect and measure carefully because you don’t know who has been working on it before, and how many times. You also need to be very careful around edges, ridges, and seams because they are usually much thinner, and that’s where you could get into trouble “burning” an edge where the clearcoat gets totally removed. If that were to happen, a re-paint would be necessary. Just read through this again. Hard work but good times indeed. 2:30AM and still here reading your posts, found my new hobby to do on restless nights. Just wanted to say Thank You guys for the excellent write ups/pics you guys do. 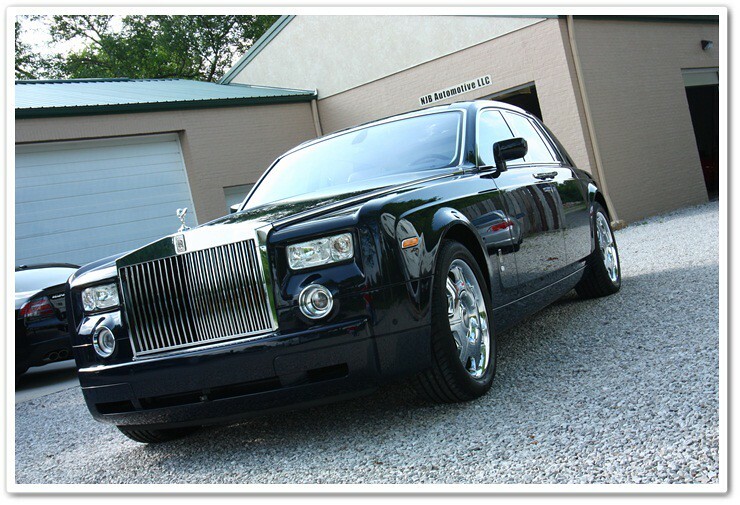 I’m small time compared to you two but my heart is bigger than this RR when it comes to my passion for detailing. I’ve learned and continue to learn a lot from your articles and also enjoy them. A huge and sincere Thank You to DJ Mayo and Todd keep up the excellent work. Wish you guys more and more success. M105, 106FA, glaze and a sealant? 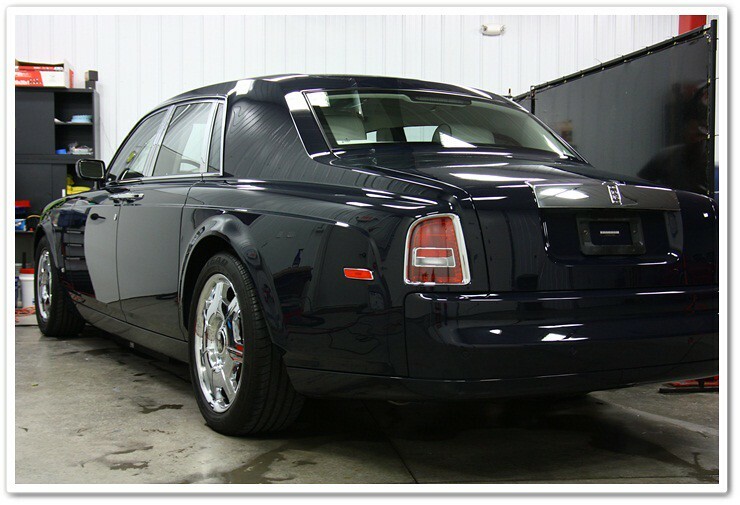 if not..could you please tell me all the polishes used on this stunning correction?..I have a Black 2009 Phantom to correct in 2 weeks that’s in similar condition, and when it comes down to perfection, I am as demanding as DJ and Todd. I’ll appreciate your timely response. Just because that combination worked on our car doesn’t mean it’s going to work on the one you will be correcting. You’ll need to do a full test section to see what combination(s) will work best on that particular car…on that particular day. There’s a good chance your black paint will react differently than our blue. My game plan for this particular vehicle is M105 or M101 w/MF pad followed by PO106FA w/whitepad and PO85r w/black pad sealed w/Blackfire and topped w/Swissvax Crystal Rock..
is there a detailer in Atlanta that you could recommend. Wow! I can't stress enough of how happy I am that I purchased these products from Detailed Image. You definitely have a long time customer.